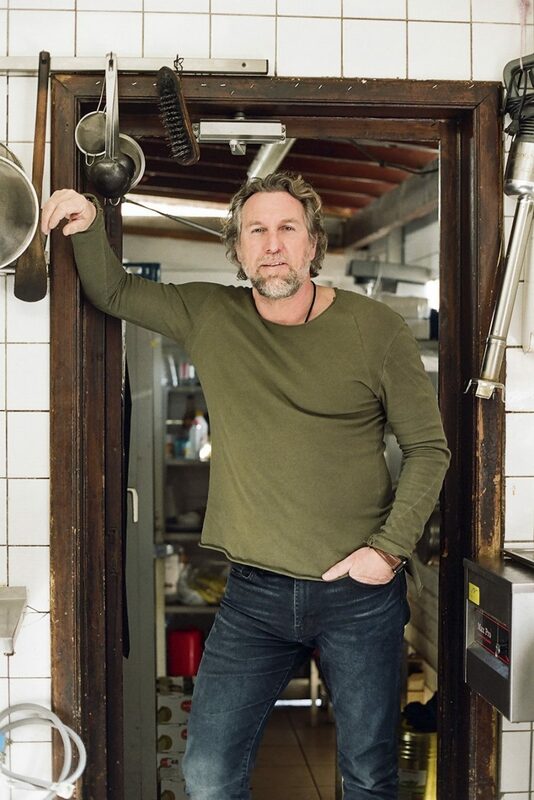 I started working in the hospitality industry when I was 21, cooking spaghetti with my friend Olivier Van Landuyt for more than two years at Pattatezak, which is well-known for their Bolognese sauce. It made us want to open a similar kind of place of our own, so we found an old local bistro on Rue de Wandstraat, arranged it a bit without losing its character and created a smaller menu with typical bistro dishes. I manage the team, so I like things to be clear and organised. I speed it up when I need to, but I also like to be in touch with people, as I have a good sense of humour and commerce. I’m proud that my childhood friend Olivier and I have been working together smoothly and successfully for about 27 years now. A kid from the streets of Brussels. Belgium and its people are authentic, spontaneous and natural. Benoît Poelvoorde, Jacques Brel and Eddy Merckx, because they’re authentic characters who really go to the end of things with their guts. Both Skievelat’s in Sablon/Zavel and De Wand, for their typical Belgian cuisine and atmosphere. I’d take them for a walk through Rue Blaesstraat, Rue Haute/Hoogstraat, the Marolles and the flea market on Place du Jeu de Balle/Vossenplein: an emblematic Sunday morning filled with Brussels culture and folklore. Mayonnaise is surely the oldest sauce associated with fries. It was only later that we were blessed with ketchup, andalouse and even Brussels Ketjep’s Dallas. I got to know Brussels Ketjep and Sylvain through a friend of mine. I immediately thought his ketchup was delicious and was going to take off in Brussels, so I ordered some for Skievelat De Wand and Sablon. My customers loved it. Then Sylvain had the brilliant idea of creating Dallas, Mostoed and Mayo, and then David Antoine’s 16-20 sauce, which was sent out into space. A genius yet typically Belgian idea! I tell so many stupid jokes to my friends and clients that you could say I’ve been making Belgian jokes ever since I could talk. Because they’re authentic and believe in what they do 100%.